At Otakon 2008, a new sort of industry panel took place. 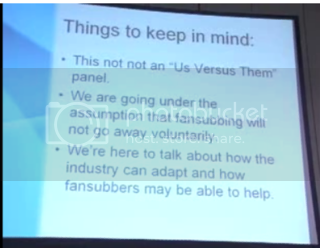 Attempting to bridge the gap between the American anime industry and the fansubbers that are increasingly overtaking them as the means fans use to get their anime, the panel hosted several prominent fansubbers (under their IRC pseudonyms) from groups LivEEviL (YaoiBoy), Shinsen Subs (GetFresh) and Dattebayo (Hisshouburaiken and Interactii), along with Funimation’s Lance Heiskell, Media Blaster’s John Sirabella and MB production guru Sean Molyneaux. The panel was hosted by Ken Hoinsky from the new translation company MX Media. As you may have noticed, weekly translator HisshouBuraiKen makes a big appearance in this video, flesh'n'bones, so if only to put a face to the weekly translator check it out! Do I really sound like that? Gah. Very interesting video, it was great to get input from both sides. Fansubbers and official companies should work together, somehow, some way. I guess the big problem is that when a handful agrees to help, there's always going to be those others who think that business, no matter how great it's trying to be, is inherently evil. Squirrel, one small issue with that. Removing the files after they've been released is kind of impossible since while they may not exist on the site anymore, they would still exist everywhere on the internet. Awesome Travis Touchdown Hisshou. glad to hear some members in Dattebayo are getting work, hope somebody has been paying for your translations. wow it was good to hear both sides on the issues.they can't blame fan subb just like tv and music can't blame anyone else all they can do is blame is the big boom of the internet. Will they be doing this again next year? Great discussion panel, very interesting, but what is with the glove HBK? thanks for sharing, i watched the whole video even when i have test next thing tomorrow. the Americanize thing is so true, nobody likes it. They even doing it in manga industry. One more thing is that not all ppl have the luxury to buy every DVD for every anime they watch, some of us only buy DVD for anime that we truly love just for the pleasure of owning the real legal stuff and for some of us who live outside america we even have to deal with currency exchange.